Where advanced project management gets quality standards. 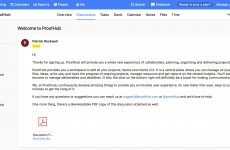 Say goodbye to broken products and welcome perfect output from your team with Proofhub! 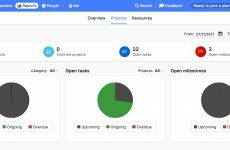 Proofhub is a project management tool built to help you plan, organize, manage, and deliver projects on time. 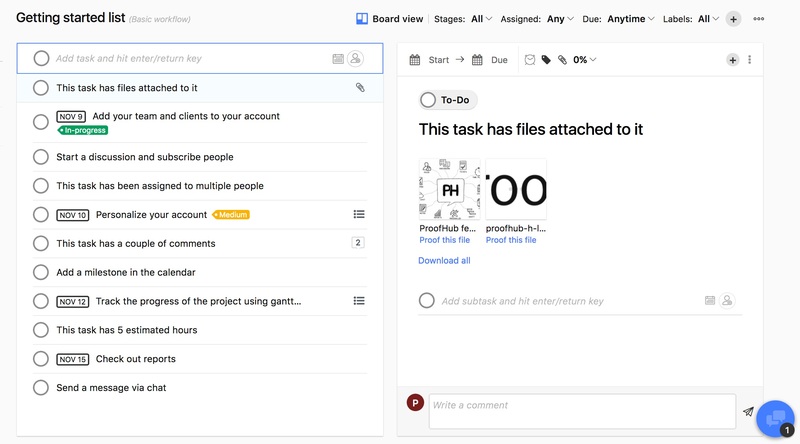 This solution gives you and your team a centralized workspace to collaborate and improve your daily workflow within projects, tasks, and subtasks. This software offers exceptional features like gantt charts, time tracking, reports and group chat to help teams of all sizes achieve more. Their Custom Roles feature allows you to easily manage the level of access your teammates and clients have within the platform. 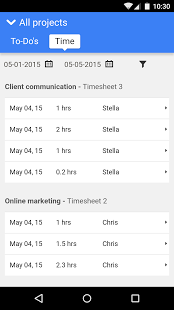 I love this option because it creates a simple way to share notes, reports, timesheets, and efficiently chat with clients. Proofhub also allows you to personalize your interface with colors, themes, and your company logo to match your preferences and retain brand identity. 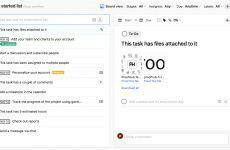 While this solution is pleasantly robust, it’s missing important features like a budgeting tool, recurring tasks, and unfortunately is slower than I would have expected. I feel this unique software delivers the simple UI of an advanced Todoist with the power features of Wrike plus a few of its own heavy hitters. Their proofing tool is by far the most impressive feature offered as it reduces dreaded email chains and speeds up the approval process. This allows for instant collaboration among team members and clients as users are able critique files, designs, and reports by commenting and highlighting the areas that need updates without ever leaving the tool. Every time an update is made, a new revision or “proof” is created so you can go back and see changes or revert to your favorite version. Decision makers are sure to love this feature as it helps make the feedback process clear and concise. 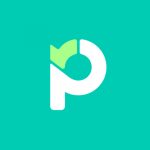 Proofhub’s onboarding is amongst the best I’ve ever seen. Slick, helpful, and intuitive. Expect to know the ins and outs in 20 minutes or less, and if you have any trouble they provide sample projects and thorough tutorials to set you back on track. A warm welcome when compared to the traditionally cold intros found in this industry. This tool isn’t specialized for a particular team size. Small teams will love it for its ease-of-use, and large teams benefit from the extremely low price point starting at $45/month with unlimited users! 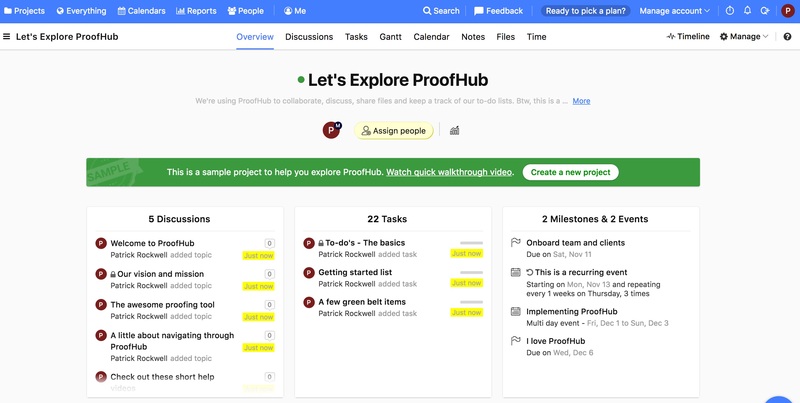 Proofhub combines advanced project management features with an intuitive layout to help increase collaboration and deliver projects efficiently. 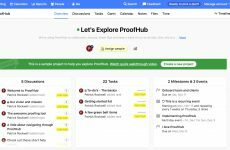 ProofHub enables us to coordinate tasks, lead discussions within smaller groups and ensures that everybody sticks to individual and general deadlines. We like how easy ProofHub is to use. We can change and edit things, without having to start all again. + PROS: Targets my immediate needs and helps with projecting future work. Really like the "me" addition. New to the tool, but customer service has been fantastic so far. Not sure this is suitable for our team as a whole, may have go back to Basecamp or browse other options on here. + PROS: Good for working with small marketing project teams. - CONS: Lots of notifications to your email, which I changed in the settings..but now I feel like I don't have as much insight as I want. Simple, intuitive software that helps your team to stay organized and makes collaboration effortless. Our team loves the proofing tool – it has expedited our approval process. 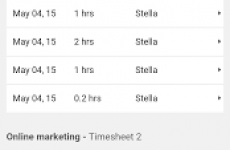 + PROS: Great reports, really good native calendar and extremely affordable. - CONS: Has features to handle agile methods, but lacks a clear product backlog, which is essential to flexible product development. 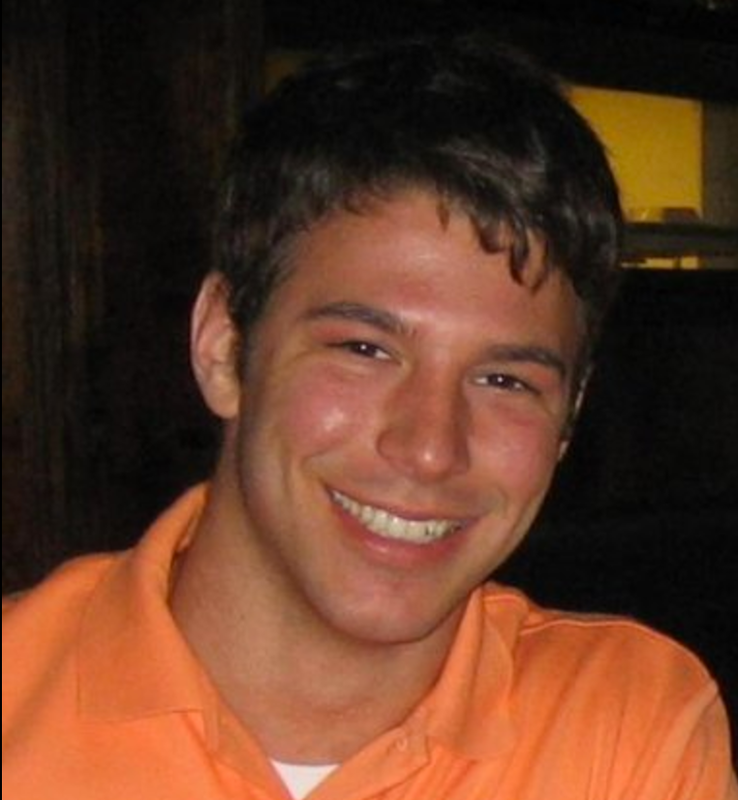 + PROS: Reports, me views, quickies, project templates, gantt charts. Simple with some major features. + PROS: Clear interface. Quick and easy setup. Nice balance of features and simplicity. Competitively priced. - CONS: Lacks budgeting tools. No recurring option for tasks. Slow. Occasional interface annoyances. We used for a few weeks but the software had too many bugs and began to slow down our productivity. My team loves this software!